HomeTravel ArticlesFamily ArticlesFour Seasons of Family Fun! Looking for the perfect family-friendly resort for your next vacation? Look no further than Arnesen’s Rocky Point Resort in Roosevelt, Minnesota. At Arnesen’s, you can leave behind all those pesky distractions and focus on reconnecting with your loved ones. One activity that you and your family will love doing together is fishing. 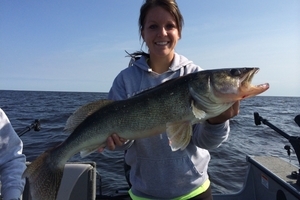 Arnesen’s is located in an ideal fishing spot on Lake of the Woods. You can pursue fish by the famous Lake of the Woods reefs, Archie’s, 12-Mile, and Gull Rock, all of which are located right outside of the resort’s marina. Within 10 minutes of travel time from their marina, you and your family can find trophy-sized walleyes, northern pike, saugers, and perch. The resort has a fleet of modern charter boats which are equipped with depth finders, global positioning systems, and downriggers. Their captains are experienced, licensed by the United States Coast Guard, and are experts at a variety of fishing methods like drifting and trolling with spinners, jig fishing, bobber fishing, and downrigging. Arnesen's is the perfect spot for an unforgettable vacation, no matter the season! During the winter months, you and your family can enjoy fun-filled activities such as ice fishing, cross-country skiing, and snowshoeing. You can enjoy the ultimate ice fishing experience at the resort, with heated fish houses with brand new, state of the art track vehicles that are equipped with positive flotation and global positioning systems. Snowmobile Lake of the Woods’ hundreds of miles of groomed trails or take a trip across the lake. During the summer months, charter fish or take your own boat, kayak, or canoe out on the open water. Then end the day with a family BBQ at your spacious cabin, each of which features a grill and picnic table. Northern Minnesota has so much to offer! After exploring the great outdoors, you’ll want to come back to the comfy accommodations at Arnesen’s. With a variety of lodging options that range from one to four bedrooms, Arnesen’s can easily accommodate any size family. Their cabin and mobile home rentals feature complete kitchens, flat-screen televisions, and satellite television. In addition to offering affordable accommodations, the resort provides lakeside dining with spectacular views of the lake at Rock Harbor Lodge. Enjoy steak, soup, seafood, sandwiches, and more while enjoying a stunning sunset over Lake of the Woods. "Rocky Point is the perfect place to gather with family and friends. Lake of the Woods offers something for everyone and there are endless activities to keep you busy," explains owner, Kay Arnesen. 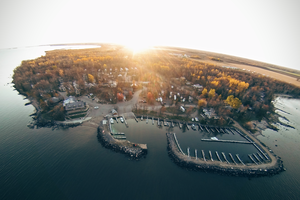 Pack up the whole family and escape to Arnesen’s Rocky Point Resort for an unforgettable Northern Minnesota vacation!